Teaching freshmen students in their first engineering course has taught me the power of making an impression on young students in the STEM field, while at the same time teaching me organization and how to work with faculty. Mark Fisher has enjoyed taking on new challenges and responsibilities as an emerging leader throughout his time as a mechanical engineering student at UMBC, from ROTC to the classroom to the res hall. Fisher has served as battalion commander of the Johns Hopkins ROTC program, of which UMBC is an affiliate university. In the ROTC program, he explored leadership styles to prepare him to serve as a commissioned officer in the U.S. Army Corps of Engineers after graduation. Fisher has worked as a teaching assistant introductory engineering over the past three years, assisting first-year engineering students and, most recently, serving as lead teaching assistant. He has also served as lead resident assistant in UMBC housing. Beyond providing experiences that have helped Fisher define a path for his future career, UMBC has also played an important role in his personal life. Fisher met his wife, Skylar Dewees Fisher ‘16, biological sciences, on the first day of classes in their freshman year, and they married this January. They will graduate together this spring. 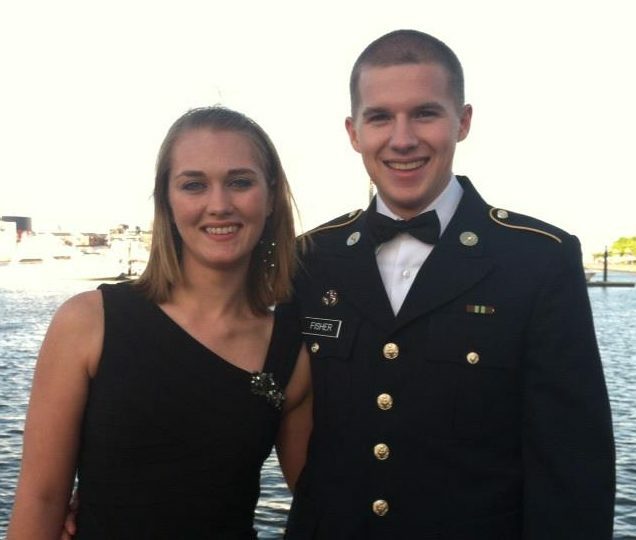 Images: Mark Fisher and his wife Skylar on their first date at the ROTC ball; photo courtesy of Mark Fisher. Portrait by Marlayna Demond ‘11 for UMBC.